Informations about famous wildlife sanctuaries & wildlife / tiger parks in northern, southern, eastern & western region to view wild species and migrated birds in their natural habitat. Inbound Wildlife seeker travellers from all over the world are increasing day by day to visit wildlife / bird / tiger reserves in india and enjoy elephant safaris, tiger safaris, bird watching, eco tourism, wildlife safaris, camel safaris in dense flaura and fauna in indian jungle tourist can take photogrpahy of wild games in jungles. India with around 89451 species of fauna has one of the richest natural heritage in the world. During your trip to any national park and wildlife sanctuary we will arrange best & adventurous accommodation of your life in some of the best services jungle / wildlife resorts. During your trip to wildlife parks and sanctuaries, enjoy elephant back safaris, which are often better way of getting closer to the nature during wildlife / tiger trails and wildlife photography. Jeep safari is also available in each wildlife parks and sanctuaries to explore life of wild animal. - In the last five years, Ranthambore national park has become one of the finest places to view tigers in the wild. In fact over the past years, the tigers in Ranthambore have been rewriting their own natural history. This area, a fragile paradise set between the Aravali and Vindhya ranges is about 340 kms. from Delhi. Main attractions of Ranthambore are Wild animals, jeep / canter safari, ranthambore fort etc.. Best time to visit ranthambore national park is from October to June. - This national park contains a wide variety of habitats and high density of game, including a large number of tigers and others wild species. 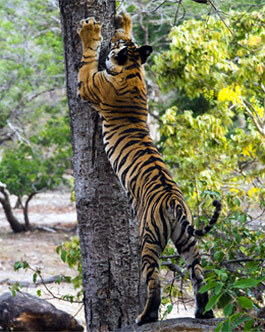 Bandhavgarh National Park is set among the Vindhya Hills of Madhya Pradesh with an area of 168 square miles. main attractions of Bandhavgarh national park are wildlife safari and trails, jeep / elephant safari, photgraphy. Park is open for tourist from 1st October to 30th June. There are many ways to enjoy elephant safari but it is truly thrilling to do this during your jungle safari to explore wild species in famous wildlife park and sanctuaries, specially jim corbett wildlife park is offering this safari to see big animals in national park. Enjoy wildlife vacations tours to north india in famous wildlife parks and sanctuaries to watch bird and take photograph of many rare wild species and big cat in Indian jungle. This is probably the best short wildlife trip to India to enjoy wildlife vacations in central india & you would cover finest tiger reserves in madhya Prades including bandhavgarh & pench to see various categories & species of flaura & fauna. God's own country kerala is known for backwater, beaches, ayurveda & spa etc. Apart from these this green paradise kerala is blessed with some of the dense forest which is home of wild animal. The finest managed wildlife reserve and bird sanctuary attracts lots of individual and group tourist from all over the world. This one is probably the best weekend gateway trip from delhi to wildlife reserve in ranthambhore rajasthan to date with tiger along with famous tourist attractions of agra Taj mahal. With its rich selection of flora and fauna, located as it is in the foot hills of the Himalayas amidst superb natural landscapes, Corbett national park is very special wilderness. In 1973 project tiger was inaugrated. Besides the tiger, leopards, the southbear, elephants, hog deer, sambar, chital, barking deer and other wild species are also seen here. You can see gharial, crocodile and mahaseer fishes in Ramganga river. apart from all these various migrated species of birds are also seen here. so explore the wildlife park & sanctuaries which has every thing for wildlife lovers. This one is best national park of Rajasthan. When you would take a jungle safari either on jeep or canter your heart beat would increase when you hear the roar of the tiger. Tiger density is more here as compared to other tiger reserves. of northern india region. This wildlife park is paradise for wildlife lover and tourist from all over the world experience the wildlife adventure. Apart from wildlife Ranthambore offers other scenic tourist attarctions like ranthambore fort. Wildlife sanctuaries were established in India in the pursuit of conserving Indian wildlife. The wildlife sanctuaries in India have become centers of wildlife and tourism, and have carved a niche for themselves & attractions millions of tourist from all over the world. 1 Visit to various wildlife, tiger parks & bird sanctuaries accross india. 2 Enjoy camel, jeep, tiger & elephant safari during wildlife trails. 3 photography of rare species of birds and animals. 4 Special tailor made and customized tour itineraries. 5 Enjoy wildlife safari tours with other cultural tourist destinations in north & south india. 6 Check crediblilty of company at tripadvisor. 7 Always prefer to give more and more option of wildlife safari in an itinerary. 8 Updation on best time to visit particular wildlife sanctuary & reserves in India. 9 Enjoy best hospitality during wildlife trip to India. 10 Best Quotation in Industry. 1 According to leading newpaper The Times Of India ( Dated 30th April 2016 ). Karnataka has the highest number of tigers and elephants, the latest estimates of large wild animals in the country say. But, for a combination of tigers, rhinos and elephants, Assam beats all other states making it a must visit for wildlife enthusiasts. 2 Assam is number # 1 in rhinoceros ( 2505 ) population. Gujarat stands secong with 299. and Uttar Pradesh has 30. 3 Kerala is number # 1 ( 6182 ) in elephants population, while karnataka has 6068 and Assam has 5620. 4 Total tiger count in India is 2226. Detailed info on Indian jungle lodges & resorts in wildlife parks and wildlife sanctuaries of india and also offering online booking of these luxury & budgeted jungle resort. Tiger Safari - In India there is ample opportunity to view tigers. Tigers can be found stalking prey in the National parks. These parks encompass some prime wilderness areas where biodiversity is at it's peak. Several of India's National Parks allow you to walk inside the park to really get close to the wildlife. But, if you need to go to the remote areas of the park and when it comes to tiger viewing, then it would be advisable that you take a jeep safari or an elephant safari. Both jeep and elephant safari are ideal way to meddle into the wilds. Tiger Safaris are Jungle tours to the National Parks and sanctuaries to see Big wild Cat, observe and photogarph tigers in their Natural Habitat. Jeep Safari - Jeep Safari tours available in the various wildlife sanctuaries in India, like - Rajaji National Park, Corbett National Park and Dudhwa National Park in U.P and Gir National Park in Gujarat are some of the best ones. You will get a whole new Jungle experience in these sanctuaries while moving about in a jeep. Elephant Safari - Elephant safari is major way to explore & view wild animals in indian wildlife. Moved os elephant make is more important and approaches that it can go deep inside the dense jungle. More of all a elephant safari tour in the tropical wildlife sanctuaries of India gets you up, close and personal with these majestic animals. Camel Safari - Get close to nature on your own pace. The adventure of visiting the deserts of Rajasthan multiplies on camel safaris.This is a charming way of experiencing life in Rajasthan's Thar Desert.